2 Weeks ago, here in Madrid, friends from our neighborhood sent me a link for an urban beehive project call. Sponsored by the Media Lab associated with the Prado Museum in Madrid the initiative is organized between Beekeepers, scientists, and grafic designers. Its also sponsored by a big time bank and seams to have some legit backing. So, I followed the link and informed myself and though I only had 24 hours to prepare a project proposal I figured It was worth the shot. As the initiative is based off of a select fews desire to introduce bees into the urban environment of Madrid, the project focuses on using the low profile presence of bees in the urban environment as an indicator of the natural environment millions of people call home. Among other things in the project description, I found it very interesting that Madrid has the highest percentage of trees per square kilometer when compared to all other European cities. Even more so, the majority of indigenous trees including sycamores and poplars are fantastic sources of propolis. Lastly, keeping in mind the limited space of the urban environment the project asked that local resources be used. Hives will potentially be kept as they are in other cities and urban spaces on roof tops, public parks and as part of restaurant facilities. As the initiative has already taken place in other European and US cities I filtered through previous projects and found them all quite futuristic. Space hives, 20 feet off the ground, printable hives and even one fabricated out of plastic. All are to be mounted with computer monitoring devices which take into account air quality, temperatures and hive weight and are then presented in chart formats shifting over time. Strange but interesting at the least. Partnered with science and art, the project simultaneously aims to educate the general public on the necessity of bee populations for pollination purposes. Bad information is the worst type of education and in Madrid where bees and wasps are thought to be the same by the majority of the population, a positive light on our much needed pollinating friend is the first step to success. In the 24 hours I had to enter a description and design of an urban hive I decided to present an adaption of the Top bar hives we recently constructed in Africa. Half the length and constructed out of shipping pallet wood with the option of adding a honey super once the brood has fully developed, the Bee Free urban hive focuses on the presence of propolis within the hive to assure a heightened immune system of the colony. By joining strips of pallet wood at the 4 corners of the trapezoidal hive, bees are likely to smooth out the gaps between their joining with the sticky substance they collect from nearby trees. More propolis= better defense system= healthier more disease resilient bees. Just when I was beginning to move on to new projects, I received an email last week saying that my project was selected. 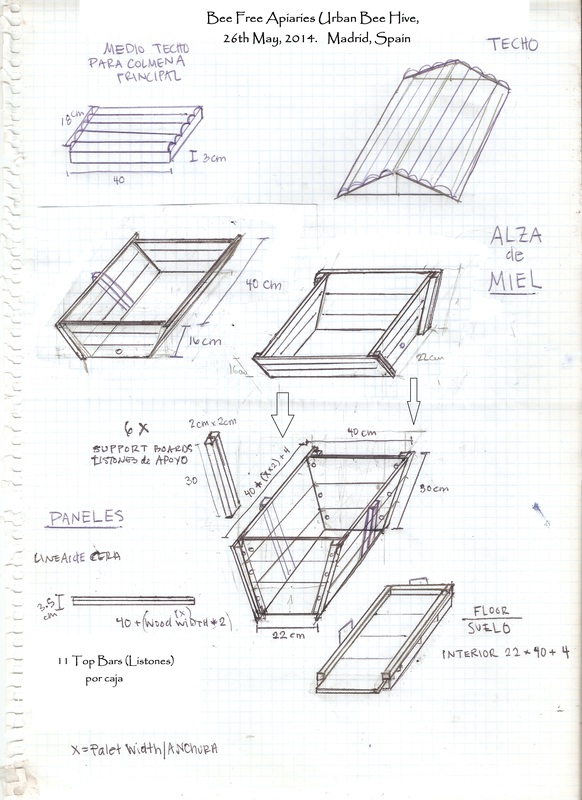 As you can see from the attached hive plan my carpentry drawings skills are a bit shaky, but as the platform begins tomorrow I figured pen and paper would do the trick. But as its a collaborative project, and teams are made in the creation of the prototypes, until I meet a graphic designer/carpenter I think it will do. Along with describing this new design Im planning on publicizing a bit of our work in Ethiopia. As we the platform, seminars and construction workshops continues through the weekend and should provide for plenty of great new experiences. Sounds like a fantastic project! Good luck on your presentation!